The new Canon EF 16-35mm f/4 L IS USM wide-angle zoom lens is designed for use on Canon full-frame DSLRs such as the EOS 6D, EOS 5D Mark III or EOS 1D X. Featuring an ultra-wide to standard-wide angle focal length it’s an ideal lens for landscape and architectural photographers, or those shooting in confined spaces. Featuring a fixed f/4 maximum aperture, the new Canon EF 16-35mm f/4L IS USM is 1-stop ‘slower’ than the existing Canon EF 16-35mm f/2.8L II USM, but benefits from the addition of Image Stabilisation. Canon’s Image Stabilisation system offers up to 4-stops of anti-shake performance, for sharp shots using slow shutter speeds, which could be a bonus to architectural or landscape photographers wanting to shoot hand-held using small apertures. The new lens also includes Canon’s Ultrasonic Motor (USM) for quick and quiet autofocus, as well as a full-time focus ring for fine tuning focus in either Manual or Auto AF modes. The new Canon EF 16-35mm f/4L IS USM will line up alongside its ‘faster’ EF 16-35mm f/2.8L II USM counterpart, and although the initial SRP of $2,000 (€1,400) for the new lens places it in the same pricing ball-park as the f/2.8L version, no doubt it’ll be cheaper than that within a few weeks. 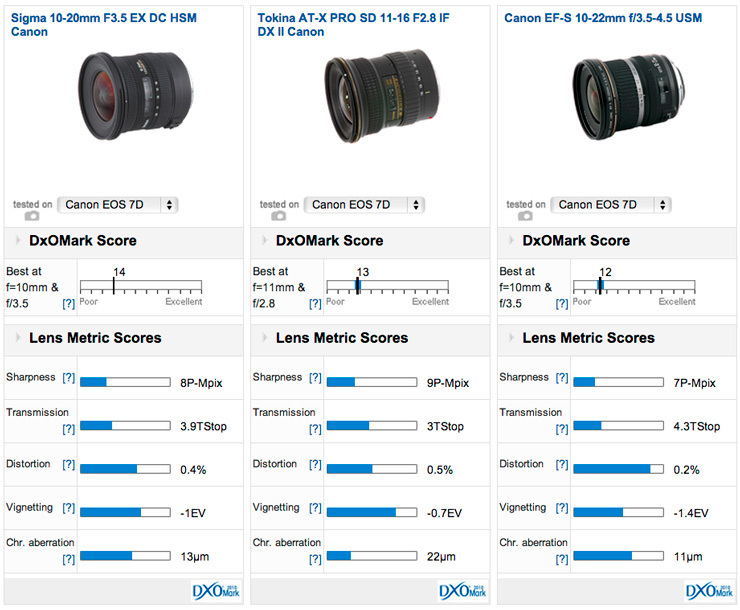 For a third-party option the Tokina 11-16mm f/2.8 PRO FX offers a comparable overall performance matching the same DxOMark Score of 22 in our tests. In fact it out trumps both Canon L–series lenses for sharpness, and all at a more pocket friendly $1,200 (€900), although the Tokina offers a shorter focal length and no Image Stabilisation. 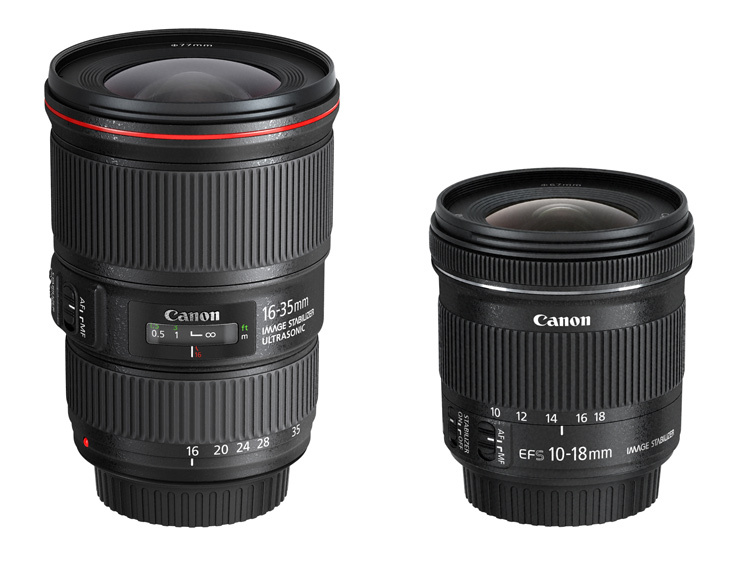 We look forward to testing the new Canon EF 16-35mm f/4 L IS SM lens as soon as it’s available in June 2014. For APS-C sensor DSLRs the new Canon EF-S 10-18mm f/4.6-5.6 IS STM lens offers an equivalent 16-29mm wide-angle focal length. With an initial SRP of just $480 (€349) the new lens will be significantly cheaper than the existing $800 (€580) Canon EF-S 10-22mm f/3.5-4.5 USM version, but offers both a shorter focal length and slower variable maximum aperture range. The new Canon EF-S 10-18mm f/4.5-5.6 IS STM does however benefit from the addition of a 4-stop Image Stabiliser, as well as Canon’s STM technology, which enables fluid continuous autofocus during video capture. 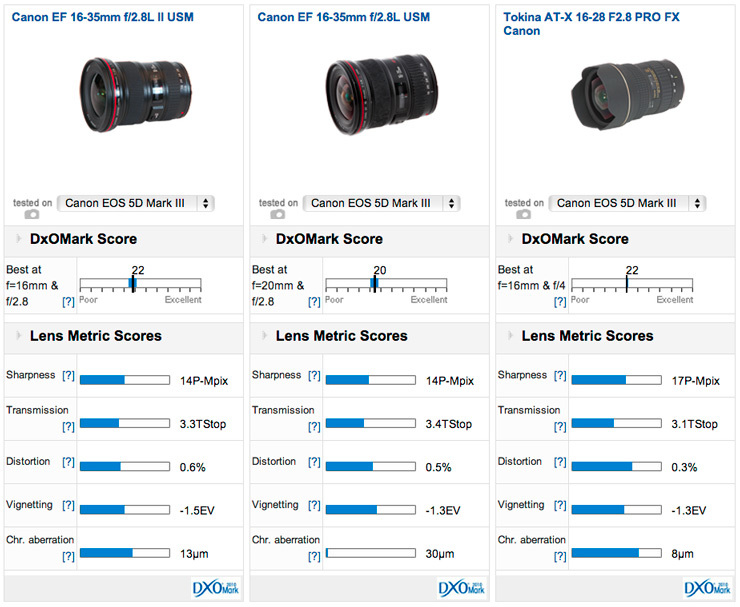 It’ll be interesting to see how the new cheaper Canon EF-S fares in the DxOMark lens tests compared to the existing third-party competition from Tokina and Sigma. Both the Sigma 10-20mm f/3.5 EX DC HSM and Tokina AT-X PRO SD 11-16 f/2.8 IF DX II performed marginally better than the Canon EF-S 10-22mm f/3.5-4.5 USM in our tests, achieving Overall Lens Scores of 14, 13 and 12 respectively. Boasting a fixed maximum apertures these third-party options are notably more expensive however, coming in at $675 (€590) for the Sigma and $1,000 (€725) for the Tokina, making the new, cheaper Canon EF-S 10-18mm f/4.5-5.6 IS STM a more affordable and attractive proposition for the consumer market it’s targeted at. Current 3rd party APS-C wide-angle lens from Tokina & Sigma only marginally out perform Canon’s EF-S 10-22mm f/3.5-4.5 USM lens – but how will the new cheaper alternative fare?